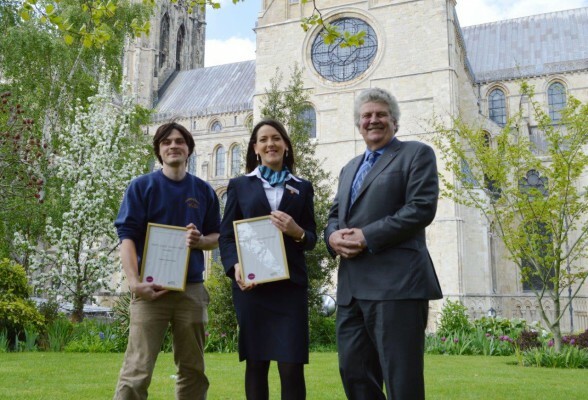 Well done to Receptionist, India Marsh, and Matt Coates from The Canterbury Historic River Tours who have been awarded the title of Kent’s first Local Tourism Hero’s by The Kent Guild: Tourism, Hospitality & Transport. The Kent Guild said “Their passion for tourism was easily spotted and nurtured by their employers and their excellent customer service skills represent a great asset that leaves visitors happy and wanting to come back”. They were photographed in the grounds of the Lodge with Mark Dance, Cabinet Member for Environment and Transport at Kent County Council and after receiving her award. Want to attend a Canterbury cathedral service? Check daily cathedral service times. Subscribe to our offers and events newsletter!